Minimalist and elegant. That impression when you first see the Vespa S150. The Vespa S150 with new colors and new engine technologies is now presented. There are elements of efficiency and sportiness are present. 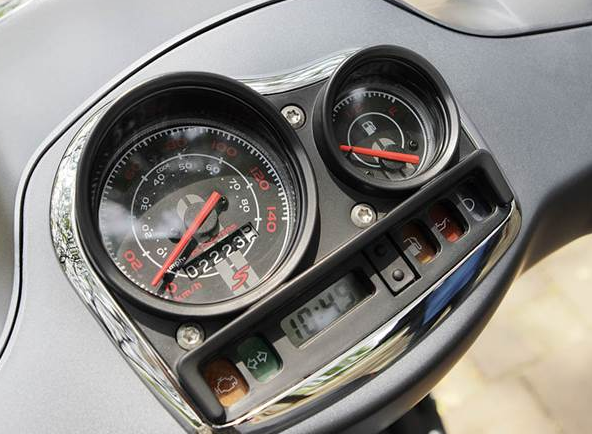 The technology is the engine use with three valves, which this scooter is claimed by Piaggio, Vespa manufacturer, as the answer will be a challenge to make a motorcycle engine efficient and friendly with environmental without sacrificing the power. 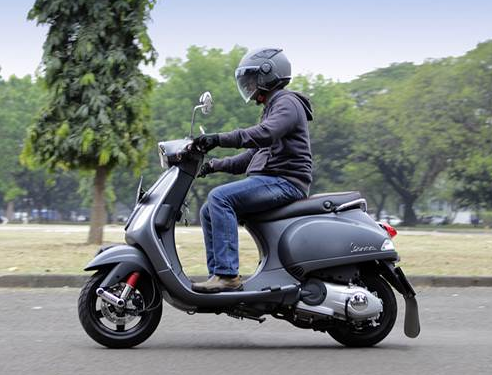 Design Vespa S is heavily influenced by the design heritage of the Vespa Primavera 50 sporty Speciale. Plus box alloy Lamps matte gray, wheels bears and black color, make this scooter more looks pretty cool. While the red color on the shockbreaker and seats looks so sporty cool. Even with a less bright color, other scoterist often glancing and sometimes asked, "Is it the original color?" Vespa colors available in a choice of 3V S150ie Titanio Grigio (gray dof), Levanzo Azzurro (blue dof), Rosso Dragon (red), Bianco (white), and the most desirable, Linosa Arancio (orange). Please try to sit down. Our testers who plays 165 cm forced to 'tiptoe' because the saddle height from the ground is 785 mm. In addition, and button's setting on the dashboard is quite so easy to achieve by the finger while driving. 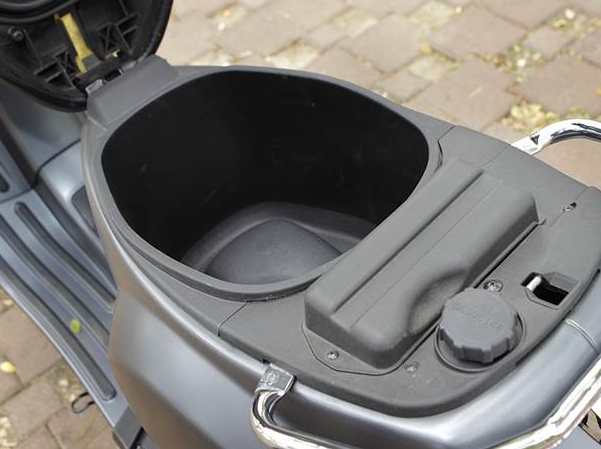 With a capacity of 154.8 cc and three valves ( two intake valve, the valve out ) this scooter maximum power produced is 11.7 hp. 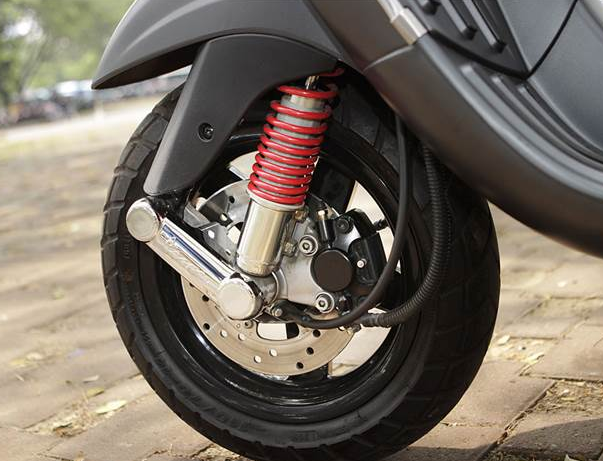 While the torque can be produced by this scooter engine is 12-Nm. To drive this scooterr with a weight of 114 kg is Highly qualified. The material supplied from its fuel tank with a capacity of 7.5 liters, sprayed into combustion system chamber by electronic injectors. So what's the difference with non 3V version? First capacity increase about 5.3 cc engine, while the 0.2 hp power boost, and increased 0.8-Nm torque. Insignificant? Maybe so. But the peak power achieved faster at lower rounds ( 7.500 rpm vs. 8.000 rpm ), as well as peak torque. If its previously appeared at 6.250 RPM, the torque is now peaking up at 5000 rpm. This is why Piaggio Vespa claims the three valves engine is more efficient. The scooter you see here has registered for more than 1.500 miles on its odometer late when getting tested, and have added an additional turn signal lights on the handlebars, and mud guard. By always using 95 RON fuel, appropriate user guide, still feels spontaneous energy for dodging traffic in the accelerate and the crowd. That a wedge is the vibration that arise when such responsibility should be accelerated while being stuck in traffic jams that often occur in the city. CVT transmissions are used as 'shocked' when shall transmit power to the rear wheels. But try to drive a Vespa S150ie 3V is constant, comfort is hard to be matched by other scooter. Vibration machine of this scoter is lost, the mono link suspension with helical springs in front and a dual action of monoshock behind, will felt making of this Vietnam assembly is so stable, though when driving alone at low speed was loud enough. The hardness volume of rear suspension you can set yourself as you need and the the front wide tires and rear also contribute to get stability. How about fuel consumption? Pretty good for this scooter in -automatic- 150 cc the class. In a recorded the consumption is about 23 kpl in the city.